The new Fayetteville High School will be built in two phases and ultimately total over half a million square feet, becoming the largest civic project in Fayetteville in the last 50 years. The first phase houses new administration, cafeteria, performing arts, and athletic facilities, and was recently completed. The second phase will house primarily academic facilities, allowing for the integration of 9th grade and will be complete by the summer of 2015. 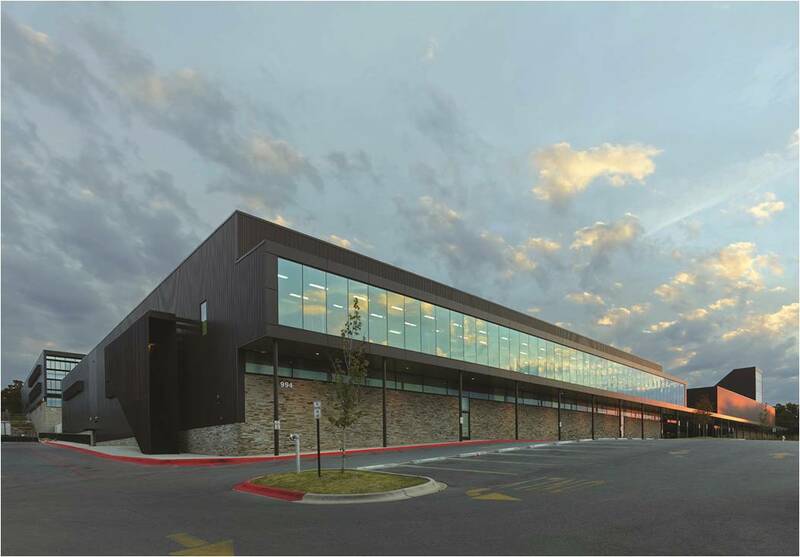 The existing school was a conglomeration of numerous buildings without an identity, but the new high school presents a unified design, embracing its role in the community and the public at large, negotiating between downtown Fayetteville and the Ozarks beyond. Using a material palette of box-ribbed metal panels, and locally-quarried stone - a less expensive cladding system than brick - the high school now has a unified identity and re-establishes its place in the community. Serving both an educational and a civic role, the new high school features greatly simplified circulation and improved security built around a public entry plaza and a pedestrian green street that mediates between the first and second phase and the 85 foot change in topography across the site. This entry plaza is flanked by the most public aspects of the school, the competition gymnasium and the performing arts, illustrating the relationship of the school to the community. The fly loft is abstracted into a beacon for the school, emblazoned with the school’s initials and illuminated at night.